Wandsworth is a district in south London, England and it is identified as one of the major centres in Greater London. That is no wonder, with the many things to see and do here. The Chez Bruce is a good example of this, as the restaurant has been top of the list as London's favourite for four consecutive years after being named as 'Londoner's favourite Restaurant' in 2006. 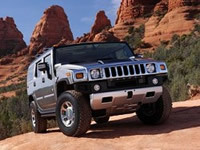 At Hire Hummer Limo we pride ourselves in being one of the best quality limo hire services in the country. We have a team of professionals ready to take your requests diligently and smoothly, plus a diverse range of Hummer limousines for hire that are manned by certified, friendly and enthusiastic chauffeurs. With Hire Hummer Limo, safety must come first, which is one of the reasons we are in compliance with VOSA. The VOSA is a company that ensures road safety for each individual vehicle, and our limousines for hire have been approved and are ready to hit the streets in style. Hire Hummer Limo is a versatile limousine hire service that can provide a wide selection of vehicles for almost any scenario. The Hummer H2 is one of our most popular limousines for hire, with an iconic exterior that leaves a great impression on passers by. It is the perfect party limo and it is at home with all sorts of celebrations like weddings and birthdays plus corporate and promotional events. Available in five colours, you may struggle to find a limousine that can impress at so many different scenarios. Hire Hummer Limo also has a number of Hummer style limousines for hire, such as the Porsche Cayenne limo hire, 4x4 BMW X5 limo hire, Audi Q7 limo hire, Jeep Expedition limo hire and more. These vehicles come with many of the features that Hummers have including flat screen TV sets, CD players, DVD players, and luxurious leather interior designed for the comfort and entertainment of its passengers. 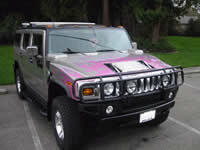 In addition to this Hire Hummer Limo has Hummer cars and the Baby Hummer limo hire is also available. The Baby Hummer is a 6-seated vehicle and it is a stylish 'baby' version of the massive stretched Hummers on offer. It is a nifty little number that works brilliantly for cruising around town with style and gets you where you need to go, making sure all the while that you and your party are having a fantastic time. Please visit and explore the Hire Hummer Limo website which is full of useful information on the whole fleet of limos at Hire-Hummer-Limo.co.uk. There you can also find details on both the interiors and exteriors of our many luxury limousines.